Here's another screenshot from my use of Tinderbox as a visual outliner tool. This one illustrates nicely how I move from a "idea cloud" towards an outline like structure. That is something you will not be able to do in traditional outliners, or with strict hierarchy for that matter. Oh, and yes. 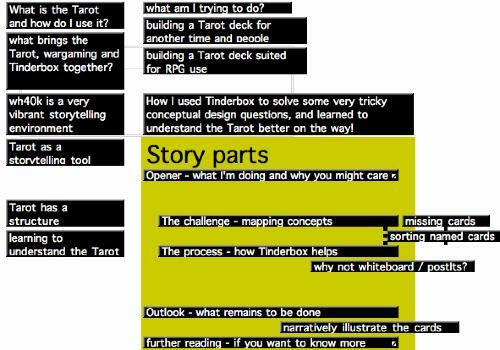 It's for an article I am writing about my use of Tinderbox to design/plan a Tarot deck.